..HAPPY HALLOWEEN from Mikey's TMNT !! - Good News from "T.V. Shows on DVD"
..-starting here.. regarding the Original Turtles Cartoon on disc ..
in an upcoming second volume !! I'm not one to brag, but WE DID IT!!! We finished D4K Issue 3, page 14, the last page, speaking o' which, and I'm nothing but elated! The problem is my whole "Draw a few pages ahead" scheme isn't working out as planned. To be honest, I've been ahead for a month or so, and for that month I've not drawn ONE THING except for dancing girls. (As the next issue continues, it won't seem as perverted or confusing perhaps as it sounded....) Last night was the first time in a while I hammered out two pages or so, and lemme just say, all you TMNT-fans will see a definate hint/nod to our boys in green. Hopefully you get a kick out of, as it was fun to draw! So, I hope you enjoy today's last page/strip in Issue 3, Chapter 1 of Lord of the Sweaters! Lemme know what you think by E-mailing me at nick@dribbleforkids.com!! ..checkin' the comments from the unlockables on the TMNT 2 Game post..
.. i really want to thank Jeremy for pointing out this cool fall Toy Fare Sneek Peek.. of Master Yoshi -starting right here !! ..yep ..we got a pretty cool Master Yoshi ..with a special head switch to turn him into a spirit Yoshi !! ..along with the little magnetic splinter pet !! Shweett.. Utroms gonna need protectin' ..there's a bunch more previews on the Action figure d0t com.. more more MORE !! - Fors00TH.. Ninja Knights..-starting here..
- More air up yir skirt Air-Ninjas.. - start here !! - More of the Battle Nexus players including a fall aprt Gen.. and a Necking Draco - start here !! - ..and Top it all off with Gen's best bunny ;bushido pal ..Miyamoto Usagi ::-starting here !! ..again..thanks for the lead ;Jeremy !! So this is it. The last big page of exposition. And, in my opinion, I think it looks great. The background needs some work, but I really like Wesley getting ready to go to war or what not. With that said, I'll see you all Thursday.... ENJOY! ..TMNT 2: Battle Nexus is filled with easter eggs.. like in TMNT 1 ..there is a set of unlockable Playmates Toys bonus galleries..including some suprise Toy prototype artworks.. some you have already seen before.. like the 'Knight TMNTs' . - Shredder in Feudal Japan Armor ..!! - The mad ; Fugitoid-hunter ..General Blanque !! ..sorry about the bad quality of these screen caps.. well least ya get an idea..
..i'll see what else i can dig up by myself or elsewhere.. stay tuned !! ..more reports of "Michelangelo's Christmas Rescue" poppin' up in the shoppes around towns.. good timing ..just before the madd X-mess dash. 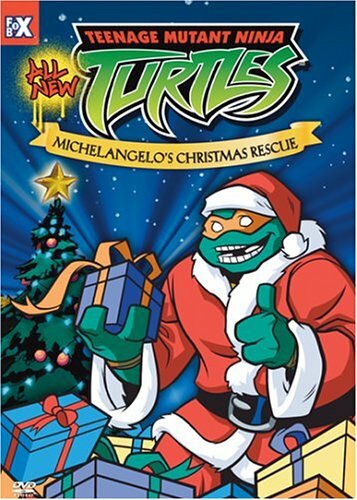 Get yir VCRs and DVDs ready..as Mikey saves the day for some very needy kids.. from some very Grinchy theives !! -- Looks like TMNT 2 ..is due out for EURO consoles in the first quarter of 2005 - quick info starting here !! Another D4K and this is one of my favorite pages thus far, just in sheer artwork and writing combined. I had a lot of fun writing this page more than some of the others as the dialouge seems to really bounce together well from character to character, and I think Jimmy outshines everyone else. Nate and Nick's writing patterns are easy to do, but to show Jimmy off as a so happy he is an annoying character. Overall, much more improvement is needed, but I really like this page. I hope you like it too! Enjoy! I called the GameStop store yesterday, where i have my TMNT 2 reserved.. they told me the shipment wasn't in until today.. they mentioend that the Prima Strategy Guide for the game would be available too so !! Wah-hoo.. good things come to those who wait !! Again ..good luck !! -- IGN has yet another look at the game -starting here..as well as a final breakdown..!! -- TMNT are featured in an upcoming new service between AOL and 4-kids !! -info starts here !! ..Mr.Berger's TMNT d0t Com's official has meched-up protos of next year's TMNT ROBO HUNTERS..-starting here !! -- ..O YEH.. don't forget..!! TMNT 2: Battle Nexus ..the much anticipated ..Multiplatform ;video game follow up should be out at your favourite stores RIGHT NOW !! I'll keep tabs on tips and tricks as they creep up !! Good Luck,gr00vy gamerZ!! ..Here's an update on our little Wood Turtle friend ..and a special contest !! Despite being sick, Nick comes at you with another new D4K!! ..once again..stalkin' the toy isles at Wal-mart ..late last night. Never fails.. the newest TMNT shipments were plopped out the other morning.. (as well as the Turtle Tunneler ..and more TMNT battle bikes..) ..i found another DVD pack in..with a differant Vid..this time i spotted one of the new 'Ripped Turtles' ..Leonardo muscle bound and packed in with the 'Evil Encounters' DVD.. like the one i found the other night 'Secrets Behind the Shells' ..these are narrorated vids of past TMNT encounters from the show.. a big 4-Kids/ FOX BOX TMNT promo ..they are pretty cool.. but just a hodge-podge of recaps.. so unless you are the super-duper completist.. i wouldn't worry about these discs. However ..if you happen upon a TMNT fig you didn't have before ..with the disc pack-in.. your in for a little treat !! .. i'll keep a look out to see if there are any other differant discs than the 2. Perhaps these really are Wal-Mart Exclusives.. if you find anything else out.. let me know !! Raka sent in even more TMNT 2 : Battle Nexus reviews -starting here..from Gamespot..
..and G.Spot has some newer screencaps from the game -starting here..
..i'm not to sure it's a Wal-mart exclusive..
.. i found a bunch of the TMNT figs with this special 'Secrets Behind the Shells' DVD packed in. ..it seems to be a neat little promo Vid for the TMNT DVD/Videos with some clips from older shows and the earlier TMNT Fox Box Bios !! ..pretty cool and a great little addition to your colelction. But don't freek out.. cuz it's nothin' really you havn't seen before. Whatever the case.. jsut lettin' ya know it's out there (assumingly at Wal-Mart exclusivly..don't hold me to that)!! -- The TMNT show is amoung some of the new programing content available on Mattel's new 'Juice Box' media player.. -checkit.. a preview starting here !! Mention the TMNT Web Site and admission is just $2.00! .. so there ya go.. Sunday is your day..Turtle beleivers !! -- ..also amoung the standard fare of TMNT updates on the offish. ..
..but the cool continuing synaps of the Image TMNT books(vol.3) -continues here..
..alls well that ends swell.. n' tOkKie's head is swollen so..i'm gonna crash .. oii !! Another D4K update has arrived. Been a bit busy actually ENJOYING myself for once with all this stress with work, so I am still here. So check out the next comic. We're almost done with this issue! And Tokka with a brande new smashing and well drawn SPAZE CRAZE!! And of course check out a D4K Poll if you could! ..MATT X-E uploaded a bit back, the infamous Michelangelo PSA from the 1990s ..where Mikey bumps his noggin' n' spouts out the 'coolnes' of brain buckets -startin' here !! (real cool,quick and fun Download !!) .. The Nausha Telegraph online has a cool article and some info regarding Peter Laird n' the Mirage crews' Ocober 10th (this weekend) appearence at the The Nashua Comic Book Show -starting here !! ..grab a pint n' then go chunder with Spaze Caze.. in this week's installment -starting right here !! ..IGN has yet another peek at TMNT 2: Battle Nexus for X-box -starting here ..
..as the much anticipated TMNT bash n' brawl sequal NEARS it's way to stores !! ..DIC's and Toy Wishes..::Ultimate Toy awards have nominated TMNT as one of the Boy Cartoon Stars of the Year (as far as toys go..) .. go vote girls & boys -starting here.. n' show your support to yir fave shell-back Green Ginsu Good Guys in plastic form !! ..as well as some other groovy toy boys n' girls !! Been sorta quiet on my end for a while, mostly due to dealing with trying to get my site back up, even tho the updates are coming out regularly, with some problems at my job as well, I just really haven't had time to update that the comic is posting. Alas, it's still on Drunk Duck!. Since I last posted on September 24th, I've posted two new comic strips. .. -this article posted from Silver Bullet !! New Hampshire's own Heroes in a Half Shell return home. It's the 20th anniversary of the Teenage Mutant Ninja Turtles, and The Comic Book Show is bringing them back to New Hampshire. 20 years ago in Dover, New Hampshire, a small studio had just finished putting the finishing touches on a new and innovative comic book. A comic book that would take the world by storm. The Teenage Mutant Ninja Turtles were the brainchild of Peter Laird, co-founder of Mirage Studios. Shortly after its completion, the first issue of Turtles debuted at the first comic book convention ever held in New Hampshire. On October 10th in Nashua, Peter Laird returns to New Hampshire to celebrate the Turtles' twentieth anniversary. "Bringing the Turtles home for a twentieth anniversary celebration is something I've been working on for a few years," said Ralph DiBernardo, who promoted the convention where the Turtles originally debuted. Now the manager of Somersworth comic shop, The Paperback Bazaar, DiBernardo has kept in touch with Laird off and on through the years. "I've known Peter since he came up with the concept and decided to give self-publishing a try. A few years ago, I ran the idea by him of coming back to New Hampshire to celebrate the anniversary, and he liked it." What started as an homage/spoof of the time's most popular comics became a near-overnight sensation. The Teenage Mutant Ninja Turtles became a multi-billion dollar merchandising juggernaut. Spawning three major motion pictures, a cartoon series, a TV show, a toy line that 20 years later is still going strong, a plethora of comic book series, trading cards and more, this New Hampshire originated idea has become an American icon. Laird won't be appearing at The Comic Book Show alone. Turtles artist Mike Dooney and Turtles writer Steve Murphy will also be on hand to sign autographs, sketch, and chat with fans. To make the celebration even bigger, other special guests will appear at the show. Rich Woodall and Matt Talbot will be signing and debuting the latest issue of Johnny Raygun, another New Hampshire produced comic book. Also appearing are The Tick and Runners artist, Sean Wang, Disney's Kim Possible artist, Craig Rousseau, comic veteran Dan Fraga and a handful of other comic book guests. The Comic Book Show will feature dozens of New England area comic book, toy, and collectible dealers. As an added bonus, fans can pick up limited edition collectible comic books from Johnny Raygun and the Ant, produced especially for the show. There will also be exclusive art prints available for purchase, and thousands of dollars in give-aways. There will be free comic books for children and hundreds of free posters provided by DC & Dark Horse comics. The Comic Book Show is October 10th at the Nashua Holiday Inn from 10am to 3pm. .. -The Comic Book Show's page starts here for more info !! Happy Birthday TMNT !! ..--from Mr.B's official TMNT d0t com..
.. you'll never guess who's BACK (in statue form)-starting here ! !